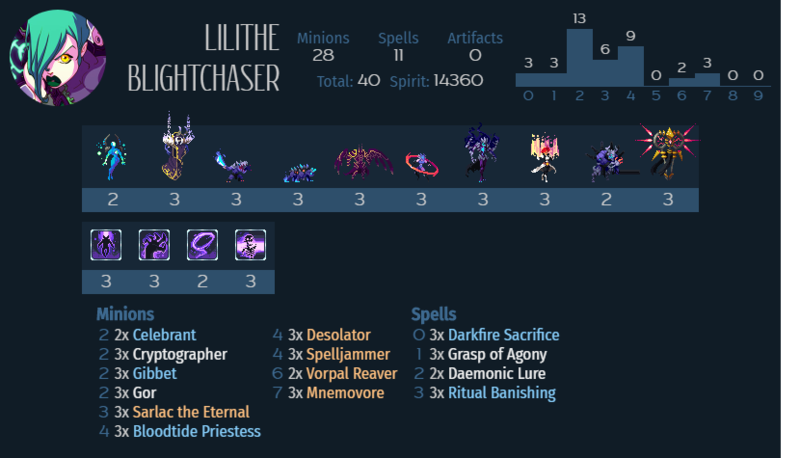 Sarlac and Gor is a combo in Abyssian sacrificial decks. Their ability to re-summon themselves makes it easy to play around natural selection and always having a minion on your board to play Darkfire Sacrifice to get bigger stuffs. However, when play with Mnemovore, each time a Sarlac or Gor resummon itself, your opponent will mill 3 cards. Playing Gibbet, Desolator, Lilithe’s BBS, Bloodtide Priestess, and Vorpal Reaver adds to the effect. You can mill all their cards in no time. leading them to have no answer for your huge swarm board and consistent damage in the late game from Desolator. Grasp of Agony, Daemonic Lure, and Ritual Banishing are tempo cards you can play in the early to mid game to reach that juicy late game. Plus, Gibbet plus Grasp of Agony is more than nasty. Sin you’re not playing Vellumscry or Inkling Surge, Spelljammer is a good body and also provides solid card draw.